Jerusalem artichoke is a valuable source of inulin, a polysaccharide. Inulin is a sustainable source of dietary fiber that enhances the immune system in humans. Although Jerusalem artichoke can be propagated vegetatively, breeders use cross-fertilization to produce novel varieties and hybrids with higher inulin yields. Seed dormancy can hinder the breeding progress because dormancy reduces the number of generations a breeder can obtain in one year. Current methods for breaking seed dormancy are time-consuming, and usually involve removing or pin-pricking the seed coat of these very small seeds, or using several weeks of seed vernalization or several months of storage. Breeders thus require better methods that are less time-consuming and achieve higher germination percentages. Here we studied germination, dormant seed, dead seed and the seedling growth rate of different Jerusalem artichoke genotypes and seed lots after seeds were treated with different methods to break seed dormancy. We evaluated fresh and stored seed lots using the following treatments: seed samples were planted on top of media moistened with either potassium nitrate, gibberellic acid or distilled water as control. Two identical sets of samples were planted: one set was germinated in a chamber at alternate 15−25 °C for 28 days, while the second set was prechilled at 5 °C for 14 days, before moving the samples to the alternate 15−25 °C chamber for 14 days. Our findings reveal that the highest germination percentage up to 85.3% was obtained when applying pre-chill with gibberellic acid. This novel dormancy-breaking treatment was thus effective in promoting fresh seed germination. This is a manuscript of an article published as Puttha, Ratchanee, A. Susana Goggi, Mark L. Gleason, Sanun Jogloy, Thawan Kesmala, Nimitr Vorasoot, Poramate Banterng, and Aran Patanothai. "Pre-chill with gibberellic acid overcomes seed dormancy of Jerusalem artichoke." 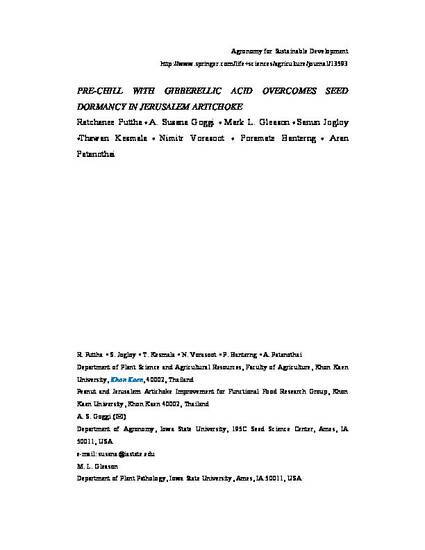 Agronomy for sustainable development 34, no. 4 (2014): 869-878. doi: 10.1007/s13593-014-0213-x. Posted with permission.